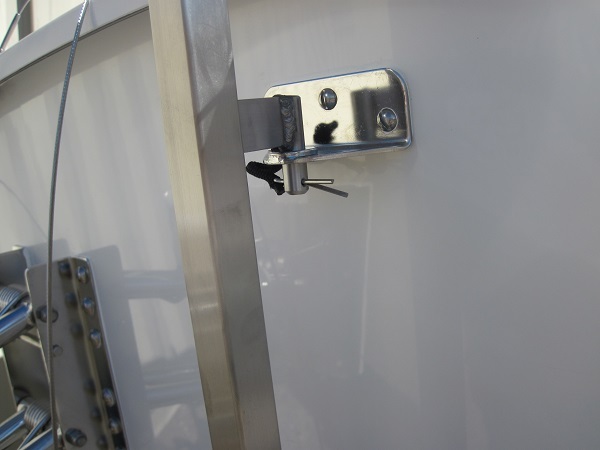 For obvious reasons when you are trailering your boat you must ensure that boat is secured to the trailer. In addition you must ensure that the mast is secured to the boat & trailer so that in a sudden stop situation the mast doesn’t become a javelin. 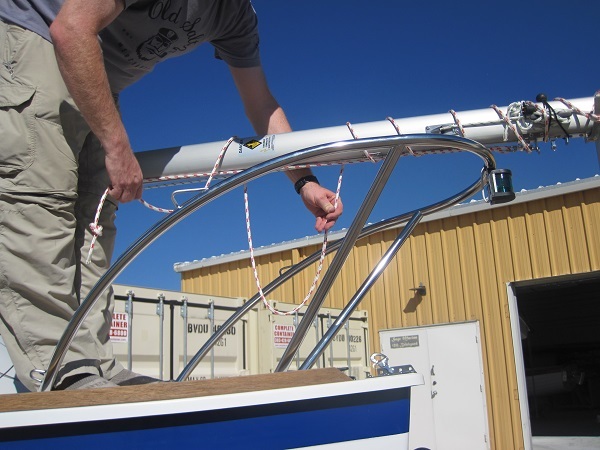 Each boat requires a slightly different securing method to create a solid mast to boat to trailer unit. 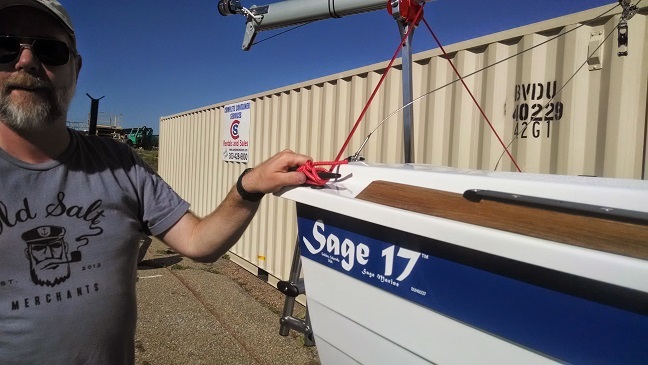 Here I’ll outline how I tie the Sage 17 to the trailer. 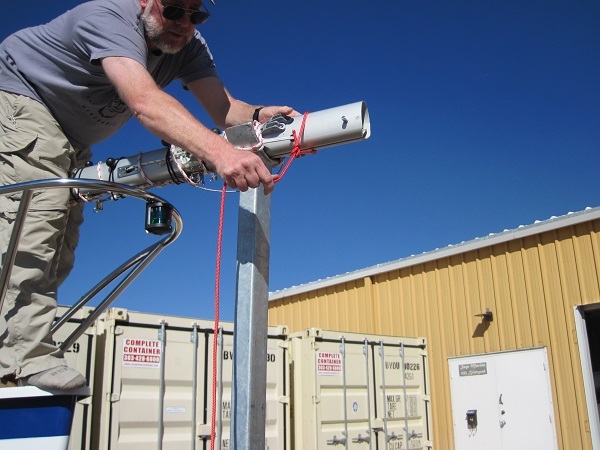 Once the mast is lowed I move the foot of the mast to the trailer mast crutch (at the front of the trailer). 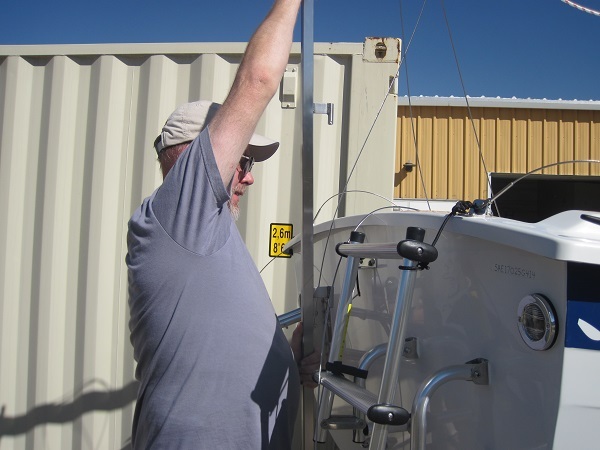 I move the mast forward until the gooseneck fitting is resting against the aft part of the trailer mast crutch (this acts to keep the mast from sliding forward in a sudden stop). 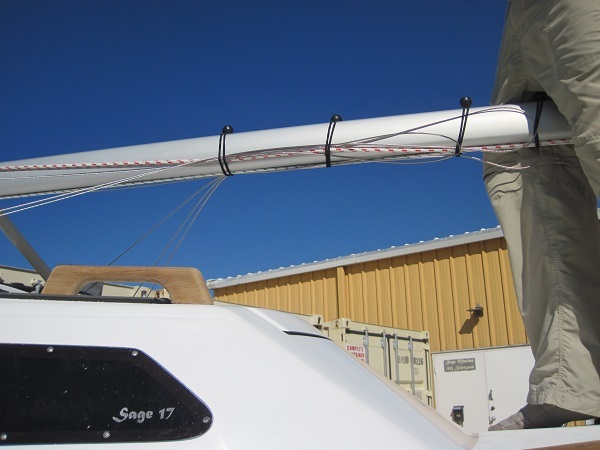 The only component of the standing rigging that is disconnected when lowering a Sage 17 mast is the forestay. the shrouds and backstay are not removed. I now get off the boat and move the transom mast crutch to the lower position and secure with a clevis pin (this is the same pin that secures the rudder when the boat is sailed). 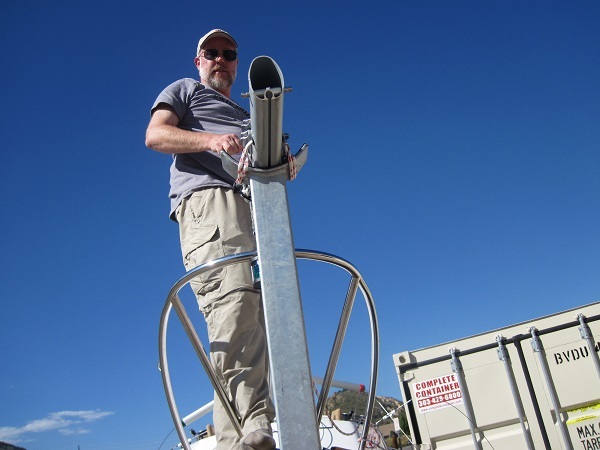 Lowing the mast crutch from ‘mast raising/lowering position to the ‘mast trailering position. 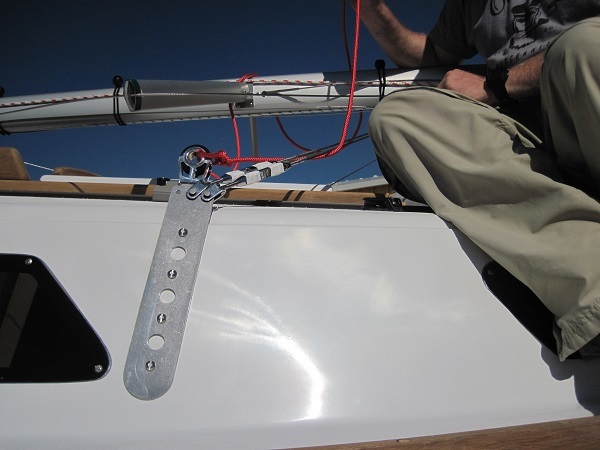 The mast crutch is held in place by the same clevis pin that holds the rudder in place while sailing. Getting back on the boat I bring the forestay forward so it loops over the trailers mast crutch. WARNING: never pull the wire shrouds so tight that they become kinked. the shrouds need to loop as they go around fittings. Next I secure the snap shackle end of the jib halyard to the mast (if the boat has a spinnaker eye this is where I lock the shackle, if not I hook the snap shackle to the mast’s gooseneck fitting. I now pull non-shackle end of the halyard so the line is snug to the mast. Now I secure the forestay and mast to the trailer mast crutch using the loose end of the jib halyard. 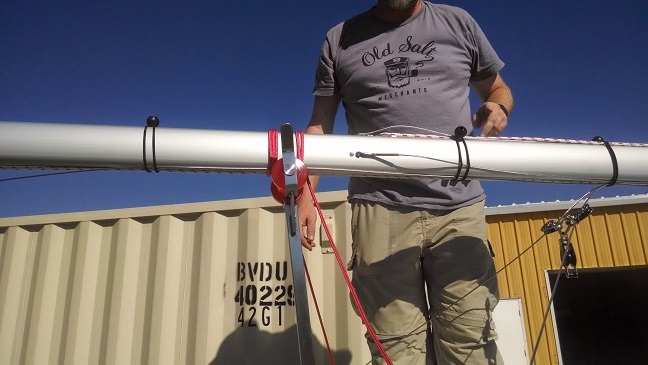 After pulling the jib halyard tight I use the halyard to tie the mast to the trailer mast crutch. The halyard is looped over the mast, under the mast crutch ‘ears’, and then across the mast, at least four times. 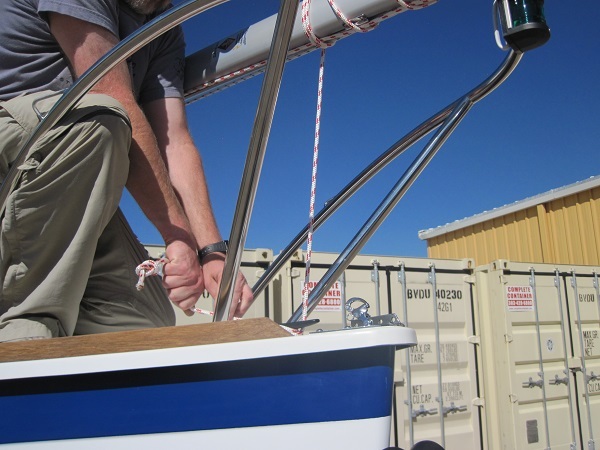 Forestay looped, NO kinks, around the trailer mast crutch and secured with jib halyard. The halyard is now looped around the mast, holding the forestay turnbuckle and mainhalyard to the mast. 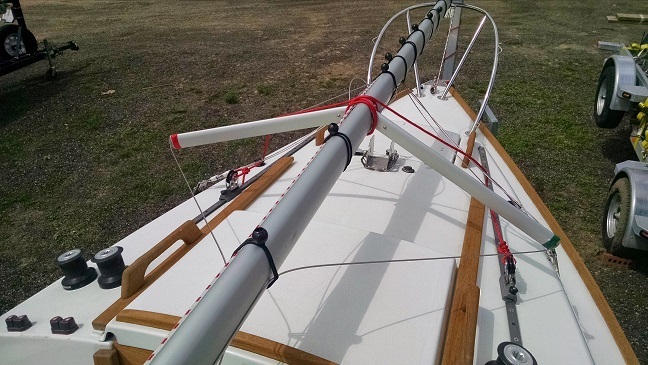 I continue to loop up the mast (or towards the aft end of the boat) until I’m above the foredeck cleat. I then tie the jib halyard to the cleat. After tying the mast to the trailer mast crutch I loop the jib halyard around mast to secure the forestay turnbuckle and main halyard. 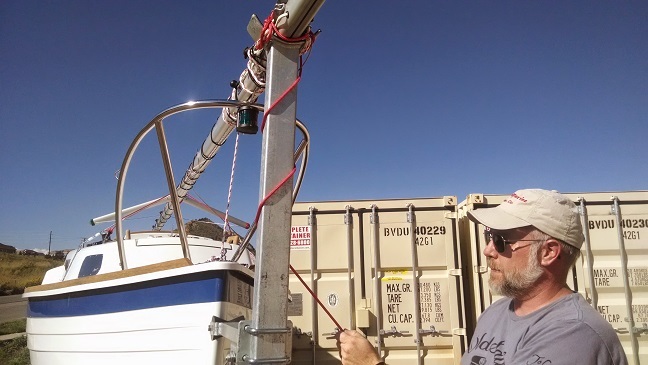 The bungee ball is holding the ‘pigtail wire’ for this boat’s masthead light. I move aft and continue to loop the jib halyard around mast. Note just forward of the bow light that the main halyard is also secured to the mast. When above the foredeck cleat I put three loops of the halyard close together. I then tie the halyard to the foredeck cleat. For securing the shrouds, halyards and other ‘things that can flap while trailering’ I use 9″ bungee balls. These are inexpensive when purchased in quantity (I buy them in 100 lots from Amazon). 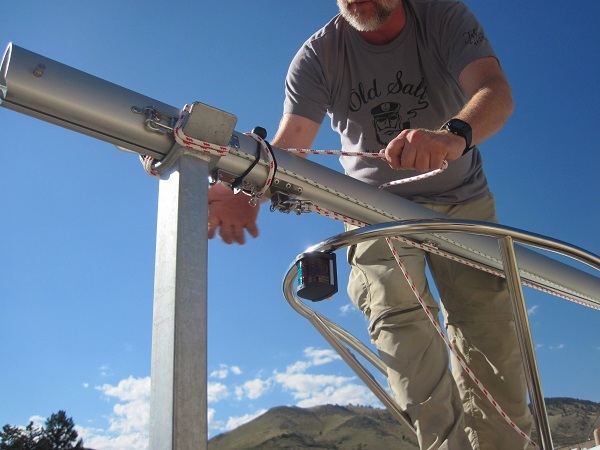 I use 20 to secure a Sage 17 mast (the mast is 22′ long). 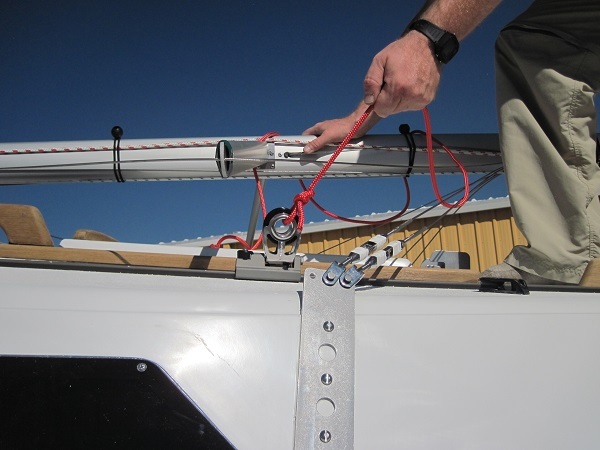 Remember, you want things to stay secure and not move … movement will leave marks on the mast and the wires could rub off the anodizing. These bungee balls will last about 9-12 months before being ‘destroyed’ by UV (if boat stored outdoors and not covered). Now I pull the uppers and lowers towards the foot of the mast (another way stated towards the bow of the boat). The shrouds are still attached to the chainplates and the mast. 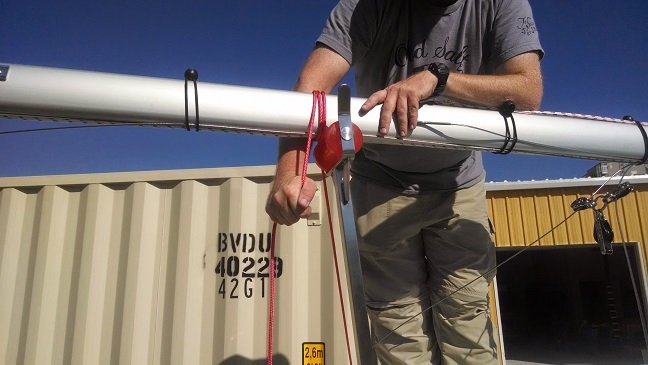 I bungee cord the lowers to the mast where they create a loop. The shrouds are pulled so they are snug, not tight, and the wire is not kinked. Lowers pulled towards the foot of the mast (bow of the boat) and held in place with a bungee ball. Note that the shrouds are looped, NOT kinked. I’ve also secured the halyards in this bundle. I then pull the uppers towards the bow and bungee cord the loop while catching the lowers. A bungee ball goes through the loop created when the uppers are pulled aft and then you go under to lowers so they are caught in the bundle. Uppers, lowers and halyards secured to the mast. The uppers and lowers should now be off the deck of the boat. I now walk aft to the cockpit and set the backstay on the transom mast crutch roller ball, under the mast. 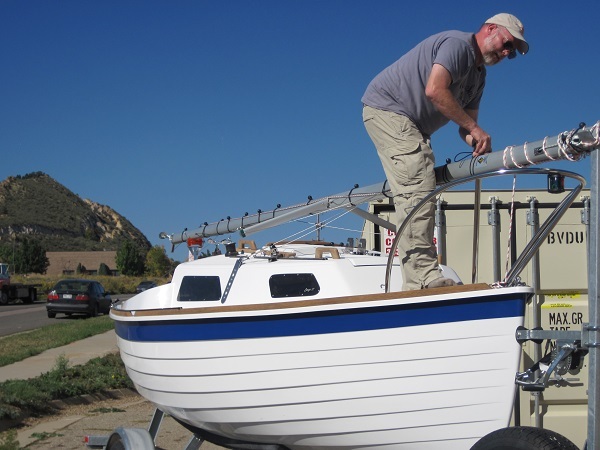 With the backstay in hand I move forward, towards the foot of the mast, until it is snug and the loop is a few feet below the spreaders (ie, the bow of the boat). Bungee the loop to the mast. 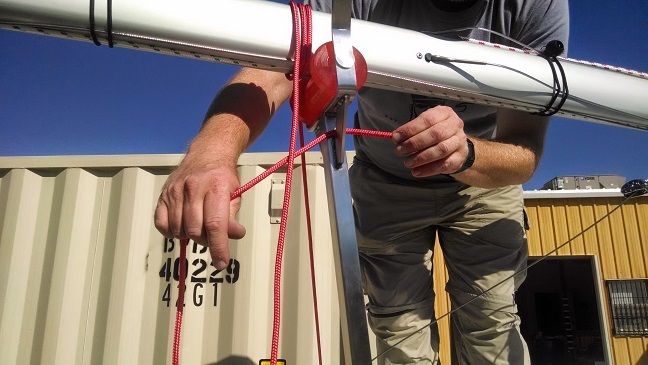 Run the bungee ball through the loop created as you walk the backstay to the bow and secure it to the mast. The weight of the backstay turnbuckle and baskstay adjuster will cause them to fall back into the cockpit. no problem. Walk back to the cockpit and bungee the turnbuckle to the mast. With this bungee also capture the forestay wire, the two uppers and the halyards. 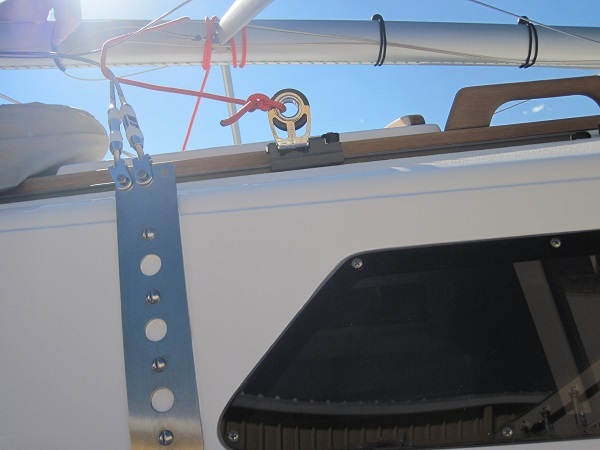 In addition to the backstay turnbuckle collect the forestay, uppers and halyards and secure to the mast. Return to the spreaders and pull the backstay, the loop, back towards the foot of the mast (ie, bow of the boat) to take out any slack. 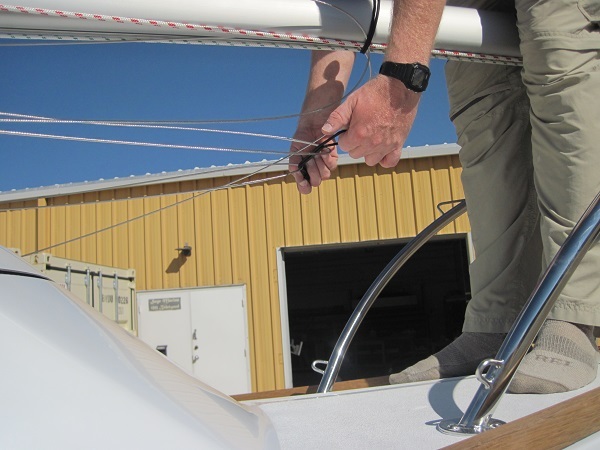 DON’T put a kink in the wire, keep a loop in the backstay. 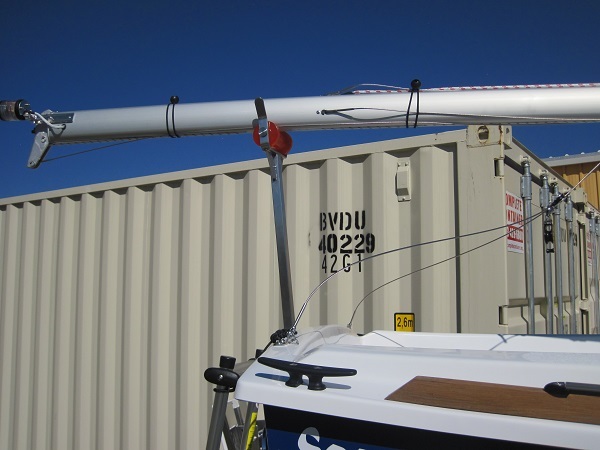 Put another bungee ball just above the spreaders (ie, the stern of the boat) to hold the backstay, forestay and halyards to the mast. Go forward and bungee the shrouds just aft of where the jib halyard stops looping around the mast. Work aft putting a bungee ball about every one foot. When the upper get so snug they can’t be pulled the mast (remember, no kinks) continue with the lowers, backstay, forestay and halyards. Work aft bungee everything to the mast about ever foot. Pictured here is the point where the uppers can no longer be pulled to the mast. When you get a few feet above the spreaders (ie, towards the transom of the boat) you will again be able to pull the uppers to the mast. Uppers pulled to the mast, and without kinking, they head out to the spreaders. Continue working up the mast placing a bungee about every foot collecting all the wires and halyards. Bungees holding the rigging wires & halyards to the mast. More bungees at the head of the mast. Lots and lots of bungees reduce the amount of rubbing the wires do against the mast. With the shrouds, forestay, backstay and halyards secured I now tie the mast to the boat. I first tie a loop into a 10′ length of 1/4″ line. 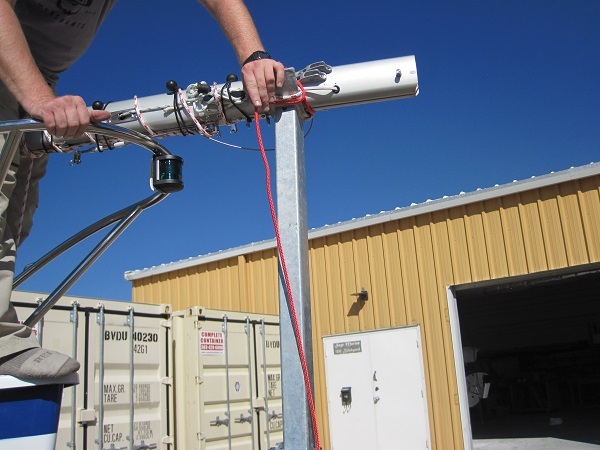 The loop fits over the foot of the mast. 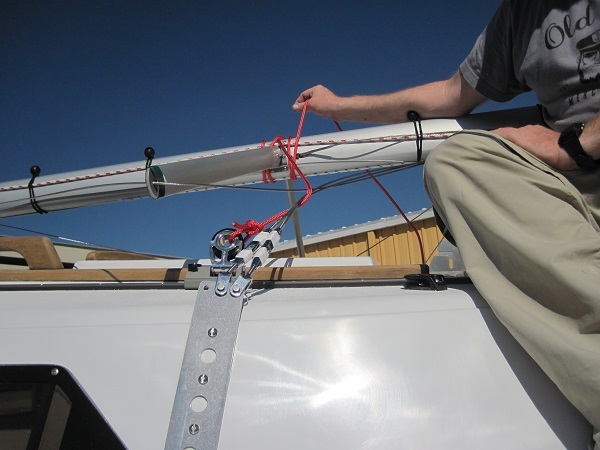 I tie the mast to the trailer mast crutch, as done with the jib halyard, and then loop the line around the mast crutch. The end of this line is tied to the trailer winch post. 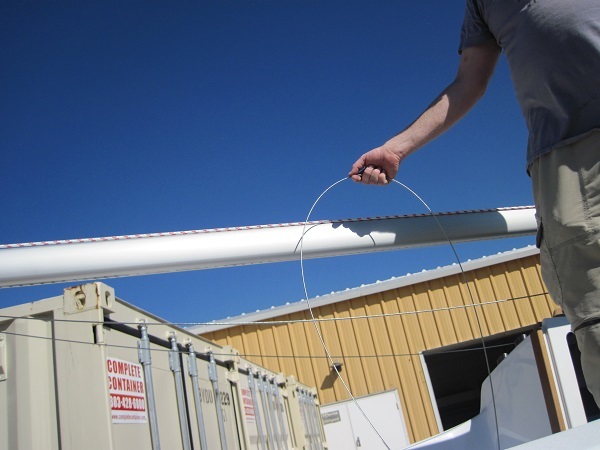 A loop just large enough to fit over the mast is tied into the line. 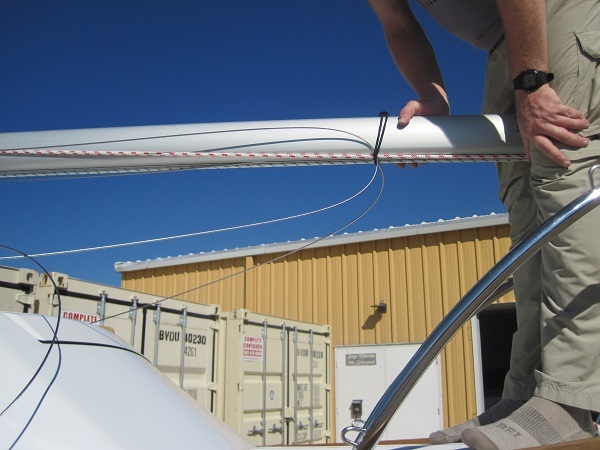 Keep the loop in the line when you untie the rigging to raise the mast … this saves you a step next time you secure the boat for trailering. 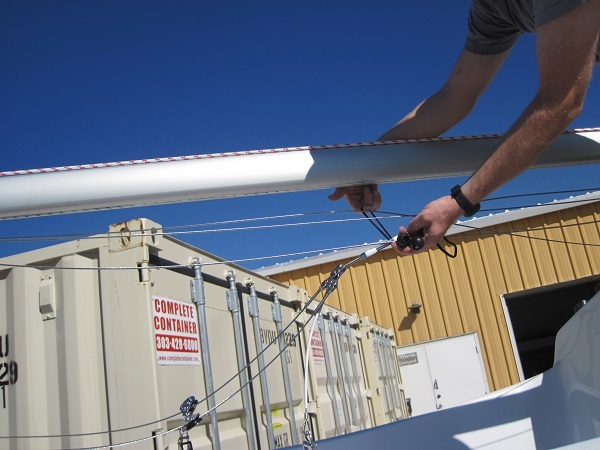 Use the line to secure the mast and forestay to the trailer mast crutch. Yes, you have now done this twice as added security to keep the mast from coming loose when going down the road. Loop the line around the mast crutch. Doing this will cause the line to have a tighter ‘grip’ if the mast moves. 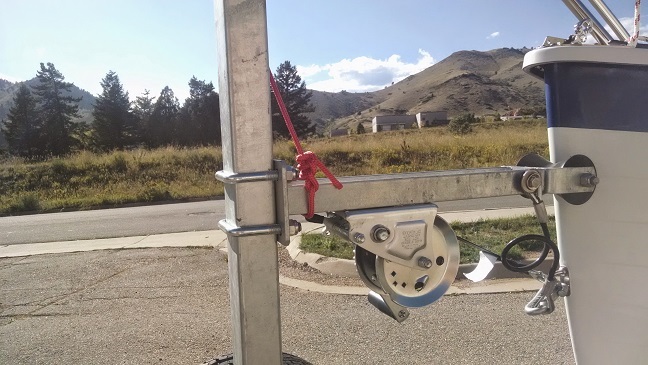 Tie the line to the trailer winch post with a series of half-hitches. Next use a 10′ line to keep the shrouds from rubbing on the cabin top (rubbing leaves black marks). I move the cabin top sheet blocks so they are about a foot aft of the tabernackle. Tie one end of the line is tied to one of the blocks. Tie the line through the sheet block’s eye. 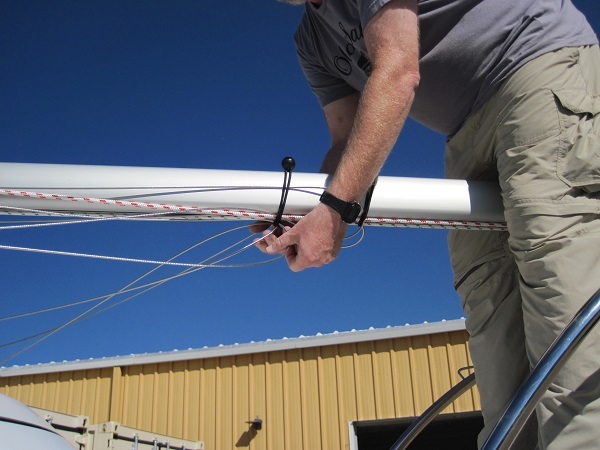 Loop the line under the shrouds, pull the line snug so it holds the shrouds off the deck, and then put two loops around the mast at the spreaders. Line looped under the shrouds. Line looped around the mast at the spreaders. After looping the line above and below the spreaders lead the line over and then under the shrouds. As before this will hold the shrouds off the deck. The line is lead over and then under the shrouds. Now tie the line to the second jib sheet car using multiple half-hitches. Line secured to the eye of the jib sheet care. Note how the line holds the shrouds off the deck. Now to secure the mast to the transom mast crutch. For this I use 15′ of line. I tie one end to one of the stern cleats. I then lead the line up to the mast where it is sitting on the roller. I make the line sung and wrap it three times around the mast. Pull the line snug and then wrap around the mast. I run the line though the gap that is between the metal supports on the transom mast crutch post and the ‘horseshoe’ holding the roller. Line run through the mast crutch ‘horseshoe’ gap. Now I wrap the line around the mast two times. Line wrapped around mast. 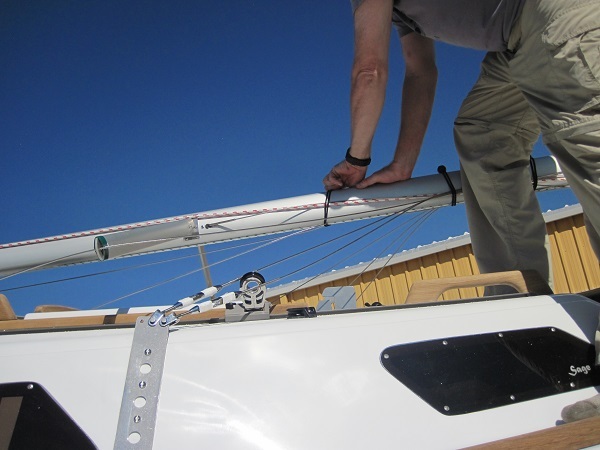 Be sure to keep tension on the line so it is keeping the mast snug to the roller. The line is now lead to the stern cleat, made snug, and tied. 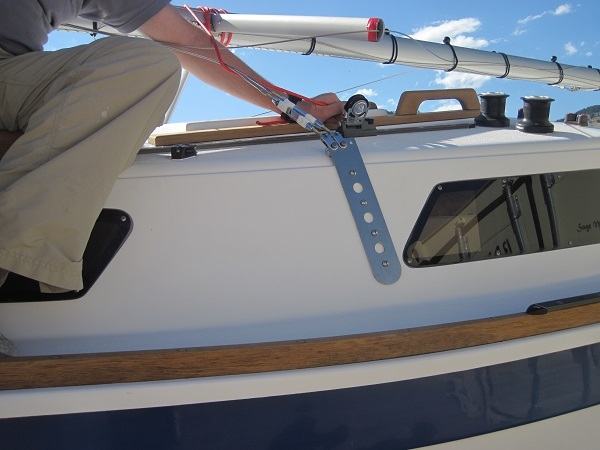 Note that the red line is secured to both stern cleats creating an ‘A-frame’ that assists keeping the transom mast crutch secured to the boat. The mast is now secured! Now to secure the boat to the trailer. Two lines hold the aft end of the boat to the trailer. These lines are tied snug and will loosen a bit when trailering. 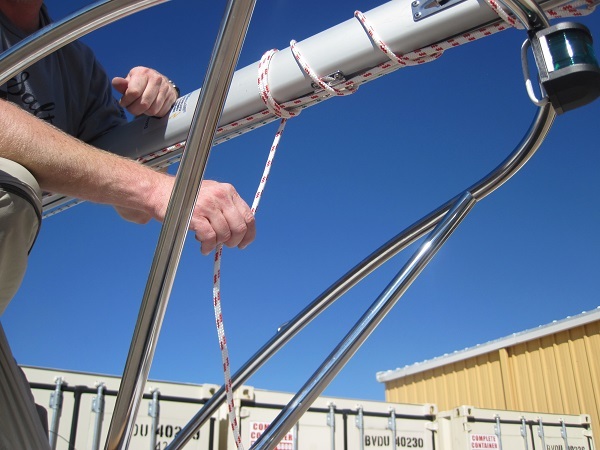 They don’t need to be ‘over tight’ as their role is to keep the boat from sliding off the trailer if both the trailer winch and safety cable, secured to the boat’s bow eye, fail. 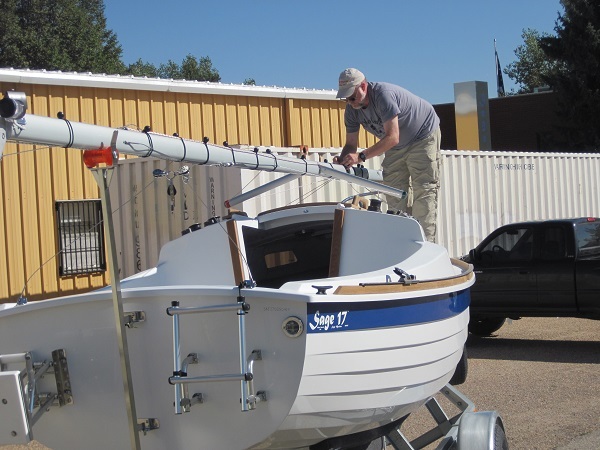 In addition the stern lines keep the boat from bouncing up and the keel jumping out of the trailer’s keel bunk. Tie one end of an 8′ 5/16″ line to the aft end of the trailer. Snugly tie the line to the boat’s aft cleat over the line used to secure the mast and transom mast crutch. Tie the stern line snug. It will loosen some as you trailer the boat. 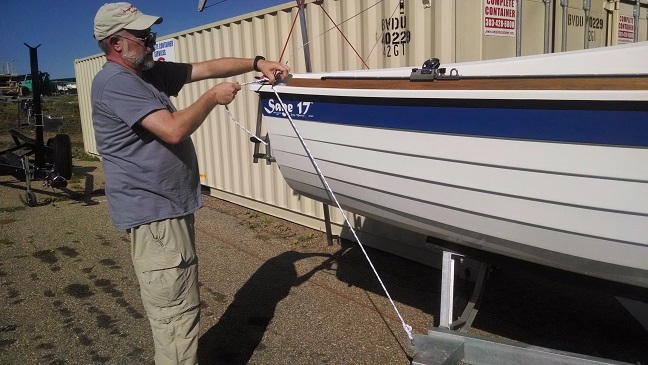 A small amount of slack is OK.
Repeat the above two steps for the other 8′ line on the other side of the boat. 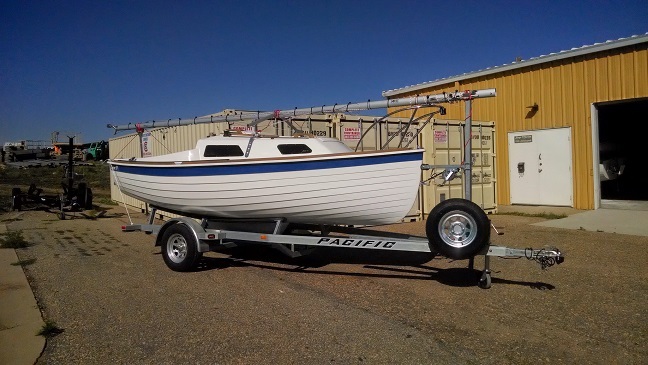 Go forward and confirm that the trailer winch is locked the shackle is hooked onto the boat’s bow eye. Also confirm the safety cable is attached to the bow eye. The winch needs to be set so the boat cannot move aft. 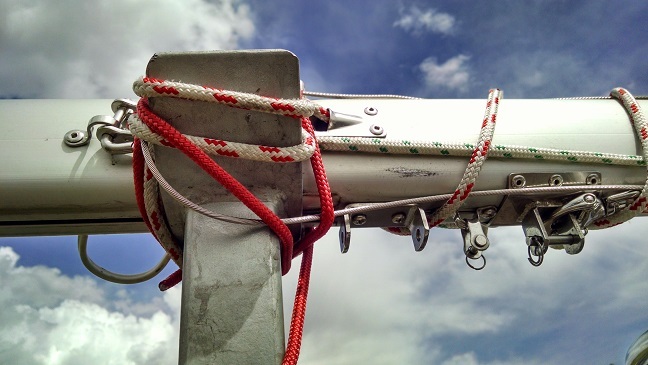 BOTH the winch line (strap in this case) and the safety cable MUST be attached to the boat’s bow eye. The boat is now secured for travel. A Sage 17 is ready to be a road warrior. After driving no more than 50 miles stop and check that the mast is still snugly secured along with the lines holding the boat to the trailer. I check the mast by attempting to push the mast up and out of the bow and stern crutches. If the mast moves I re-tie the securing lines. After the first ’50 mile stop’ you can check the mast/boat when you stop to use the restroom, eat and/or get gas. I find after two ‘snugings’ the lines don’t need to be adjusted. NOTE: I originally posted this April 2015 on Sage Marine’s BLOG. In a short time the BLOG will be closed – stupidly. I am reposting this information so it is not lost.